I used stainless steel commercial dryer doors as portholes in my 2 12′ wide “barn door” garage doors. I love this type of recycling, very original. How clever! Recycling at it’s best! I made a recessionary chicken coop myself back in June from an old wooden box(pallet size) Will post photos soon on you tube, tell me what you think? Reply with your email address and I’ll tell you when it is up there for viewing. We have four hens ourselves and they supply us with 28 eggs a week! This is fabulous! 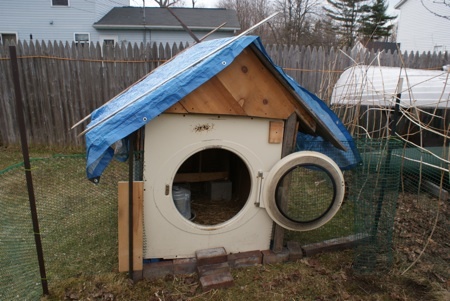 The biggest challenge is keeping those chickens safe from predators, and I do not think a fox could get into that clothes dryer if her wanted to! Like a safe for your chickens! I assume they can breathe in there….It could be made so much cuter also. I don’t know if I’d want to be this guys neighbor, but a clever idea. Any banjos there to serenade the chickens with? Save time: Put ‘em on spin for scrambled eggs!